As supply chains become more complex, consumers are in turn becoming more curious about the origins of the products they buy. This is especially true when it comes to the food we put in our bodies. Increasingly, consumers are demanding further transparency from companies – wanting to know where their products come from and what's in them. And companies are responding, establishing traceable supply chains to educate and engage consumers about important sustainability issues. Last month, seafood brand, Chicken of the Sea, launched a digital traceability initiative. The program helps consumers follow their food from ocean to can through an online experience. The initiative, called Chicken of the Sea Trace your Product, allows consumers to enter a can code to find detailed information about the product. After consumers enter the code they are taken to a website, which lists out the species of seafood with nutrition information, the region where it was caught, the method used – even the vessel that caught the fish, with start and end dates of the trip. Beyond that, there is information about how the fish was processed, where it was canned and how Chicken of the Sea supports sustainability. Currently, the program is available for Chicken of the Sea's Chunk Light, Chunk Light Albacore and Solid White Albacore tuna, but the brand hopes to expand to further categories in the future. Providing more information on the source and supply chain of products may seem challenging, but the effort can be worth the reward. The Trace Your Product site not only provides the information consumers are demanding, but it also helps educate on Chicken of the Sea's commitment to sustainability. And, research shows that the environmental impact is an important factor when deciding what dishes to put on the dinner table. In fact, 77 percent of Americans believe sustainability is an important factor in food purchasing decisions, according to the 2014 Cone Communications Food Issues Trend Tracker. A new tool that will help employers create healthier workplaces is getting off the ground. Fitwel is a health and wellness standard for buildings developed by the CDC, the General Services Administration (the government agency that runs federal office buildings). One year after the launch of the Sustainable Development Goals (SDGs, or Global Goals), United Nations (UN) officials are encouraging more businesses to engage in corporate sustainability reporting and integrate the Goals into their reporting. 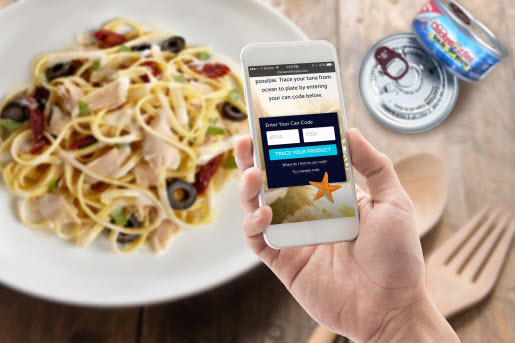 Mega-chain pizza brands, Domino's and Pizza Hut, are pulling out all the stops this fall to show the world how the Big Pie Guys and Gals do marketing with a purpose. When it comes to crowdfunding campaigns, do you ever worry if your contributions actually go where they are promised to go? GoFundMe is working to ensure your donations are secure through a new layer of protection called The GoFundMe Guarantee.. Following numerous reports of slave labor in seafood supply chains, traceability seems to have (finally) become a priority for the industry. More and more digital solutions have been emerging: last year, the Marine Stewardship Council (MSC) began crafting a traceability tool; this spring, a seafood industry-focused risk assessment tool won the Partnership of Freedom’s tech challenge to fight labor trafficking; and earlier this month, a tuna supply chain was successfully tracked and traced through blockchain technology. Patagonia Provisions' Long Root Ale is the first commercial product ever made with the perennial grain kernza. The overwhelming scientific consensus is that climate change must be kept under 2, preferably 1.5, degrees. At COP21 in Paris last year, political leaders from around the world delighted many commentators by agreeing to keep climate change under the more stringent target. On Sunday, 400 miles of streets in Paris—about half of the city—were closed to cars. It was raining, and anti-terrorist forces were on alert, but the roads filled with people walking and biking. After months of teasing, Timberland is peeling back the curtain on its upcoming collaboration with Thread, a Pittsburgh, Penn.-based fabric manufacturer that recently announced, through the Clinton Global Initiative, a commitment to address forced and child labor in the global supply chain. Will the U.S. urban agricultural movement become mainstream? It’s certainly about to garner far more visibility, thanks to legislation proposed this week by Sen. Debbie Stabenow (D-Mich.), a ranking member on the Senate’s committee for Agriculture, Nutrition and Forestry. It’s official: there are only 90 days to go until year-end. Start getting ready now by checking these three things off your to do list. More and more nonprofits are sharing videos of their work with donors, volunteers, and policy makers. Advocacy groups led the charge, using video to make their case to potential supporters, but other kinds of nonprofits have added video to their communication efforts. Meet Carla. Carla is a prime donor for Médecins Sans Frontières (MSF) Canada, better known stateside as Doctors Without Borders. She is well-educated, lives in a Canadian metropolis, is age 55 or older, and is either employed full time or retired. Carla is not a real person. There’s no question that this is a busy time of year in our field. But don’t let the hustle and bustle of year-end planning and #GivingTuesday campaigns distract you from the basics of good fundraising, especially strategic donor communications. Donors’ approach to charitable giving is changing, with millennials most likely to embrace new ideas, according to the report, which draws on a survey of 3,200 Americans whose 2015 tax returns included itemized charitable giving.